While on tour, we are holding action events to connect with schools, running groups, businesses, and local politicians. These events are exciting opportunities to meet Matt and Steph, run with them, hear them speak about the tour and the really simple ways we can all take action for our planet. If you want to be part of a high energy, interactive presentation, we'd love to hear from you! 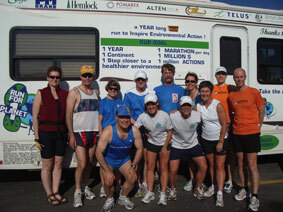 Please e-mail Michelin Tait at: Events@RunForOnePlanet.com to set it up. Help us inspire North Americans to take action for the planet: take the action challenge to your workplace. Simply print out the Action Challenge Sheet and spread it around the office. Challenge people you work with to take just one new action for earth and have their new action counted at www.RunForOnePlanet.com! Once you have collected as many names and email addresses as you can, simply scan it back to: KBenn@RunForOnePlanet.com. If the tour is coming to your town, we would love to be run in and/or out with you! We are also known as the No Speed Required Tour, so don’t worry about us running too fast for you. It will really be the other way around! If you’re part of a Running Group, or just someone who wants to run with us, please e-mail Adam Hill at: AHill@RunForOnePlanet.com to set it up. As we go, we grow! As we grow, we’re constantly seeking passionate, skilled people to volunteer with different areas of the tour. For all positions, you will help make a difference for our planet, gain valuable skills that you can transfer to your current and/or future jobs, and meet a fantastic group of talented people committed to making a difference in the world. For the duration of any position, you will be working independently out of your home, interacting with both our Home Team and our Road Team, mostly through online correspondence, plus weekly telephone meetings. Simply click here for the most recent postings. 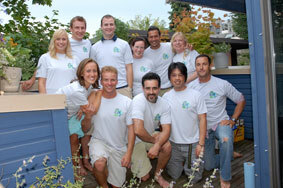 Upon completion of the tour, funds donated to the Run For One Planet will be used to set up a unique Legacy of Action that will be poised to lead the emerging field of environmental and lifestyle education for kids. Our goal is to raise $1 million. Help us create a Legacy of Action for Kids! Visit our online store too! All donations over $100 will receive a tax receipt. We now have banners for any one to use in linking to Run For One Planet. Feel free to use these on you own websites to link to Run For One Planet to help spread the word! These beautiful banners were produced by Tanya Zboya of Zboya Design.